Sinister clothing is a well-known brand which you’ll come across in almost every store or any website retailing dark fashions. They are the dreamy velvet and lace sweeping almost every goth floor around Europe. Their designs are quintessentially romantic goth with flowing lines and embellishments of ribbon roses and lashing of lace. It’s no surprise they have become one of my favourite brands over the years and it’s not just me, Julia from The Gothic Shop – one of their stockists – explains why she carries the line, “We first saw Sinister at a trade show and immediately fell in love with it. The design of their garments is wonderful, the quality is fantastic, and their sheer elegance is the epitome of gothic beauty.” The thing that strikes me most about them is their indeed their quality and fit. Every purchase comes with extra embellishments because you just know that beautiful rosette will be claimed by some wayward spiky jewellery at some point. 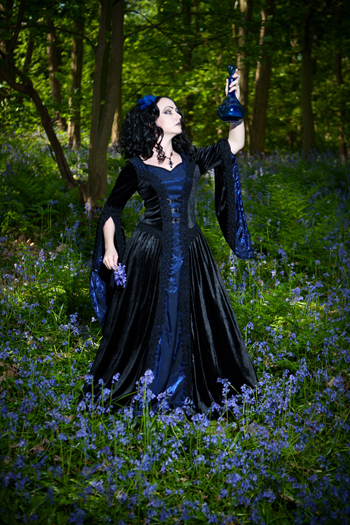 And while many goth velvet dresses can often amount to little more than sacks hanging from the delicate décolletage and shoulders, Sinister seem to know the woman’s form and how to mould the fabrics around it. My single complaint would be that I’d like a few lower necklines, however it’s good to have the wardrobe option for those rare but unavoidable demure days! Juliette, Sinister’s designer and founder says she specifically tries on every design herself and won’t let it go into production until she is totally happy with the fit. Being of the scene herself is certainly an advantage here, as she just replicates her impeccable taste which other goth girls are keen to emulate. And while a good product is part and parcel to the success of the business, the way it is run can often mean just as much. Julia from The Gothic Shop knows a lot about excellent and customer service, providing such a great level herself, and extolls the importance of being able to connect directly with the proprietor and designer herself: “Juliette is a very approachable, friendly, and helpful person. We can talk to her regarding styles and orders knowing we won’t get ‘salesman talk’ in return. And when the designer asks for your input on clothing ideas, you can be sure you’re dealing with someone who really cares about what they produce for their customers. And their customer service is brilliant. Can’t fault it. It’s very rare we’ll have an issue with any Sinister items, but if we do it’s always resolved quickly and without aggravation.” I caught up with Juliette shortly after this year’s London Edge and found out a little more about her company. So who exactly is behind Sinister? Officially it is just me, 42 and a proud mother. However Sinister would not be where it is today without all the people that have helped out over the years creating our name and one that the gothic scene can be be proud of. What would you say is your personal style? That depends on weather and mood, but I do like to wear fitted outfits and heels though. Could you tell me a bit about your history, how you got into designing clothes? Sinister started as a way to cover my travel costs, really… A friend of mine runs the best alternative shop in Amsterdam called “Diabolo” and she asked me if I could design and make some items that were “gothic” for her store. I just tried a few items and these sold really quickly: it seemed I had “the touch”. So I continued and what once started as a way to travel, soon became a serious business. 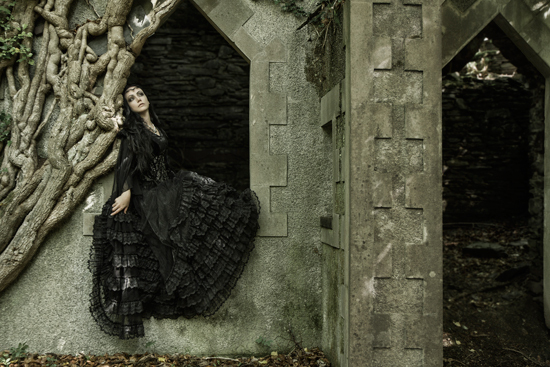 Your style is definitely Romantic Goth – what was it that drew you to this style? I cannot really explain. Personally I just think clothes – no matter what style – should have certain qualities: it should fit correctly, it should be feminine, the materials used should fall and feel right, and it should make you feel good. I think the Romantic style allows me to combine these qualities and enables me to add little extras which would not suit other styles. I thought for many months, coming up with dozens of names…but they were just not suitable… To be honest it was not actually me that came up with the name: a friend came up with Sinister, and … BANG! – that was it! It felt right – and it still does. Do you make all the clothes by hand yourself? Do you have help? No. I only had those five weeks of fashion school before I dropped out… so… a little confession: I cannot make patterns, I cannot even sew. I cannot do anything that actually is needed to make the clothes. All I have is the capability of translating my ideas into designs. So, I have two fantastic girls that help me out with patterns and sampling until we have reached what I had in mind, and we think an item is ready for the collection. What made you decide to sell through other retailers rather than sell directly to customers yourself? This was not really a decision I made beforehand… it just happened. I did not have a shop and never wanted to have one either… This works best for me for now. And anyway I think by selling direct to consumers I would undermine my own customers – the retailers, which would not be fair. Besides that – I think retailing requires a different knowledge and technique. I think it is best to stick to what you know/do best. What is your favourite historical period in terms of clothing and why? Victorian, 20’s and 50’s. In my opinion, in these periods quality, use of fabric, eye for detail etc were important. But above all: these styles were about femininity and looking / feeling good. What has been your most popular item? There is not just one item I can name… over the years it has been many items that were much more popular than others, and were so for many years…. My favourite… I think at the moment a longdress (item 822), which is very elegant, romantic (very valentine’s) and can be used in combination with a crinoline skirt. Who would you love to see wear your clothing? You don’t do any men’s clothes, what is the reason for this? I have tried in the past, but it just did not work out. Again – I think it is best to stick to what I do best. Could anyone tell? – I really do not know – it will be a combination of different factors that will decide what to do and where to go. I try to live day by day, so I will see where y path takes me.